Making plans for your vacation can sometimes be stressful, especially when you are trying to figure out where to stay in the Great Smoky Mountains. 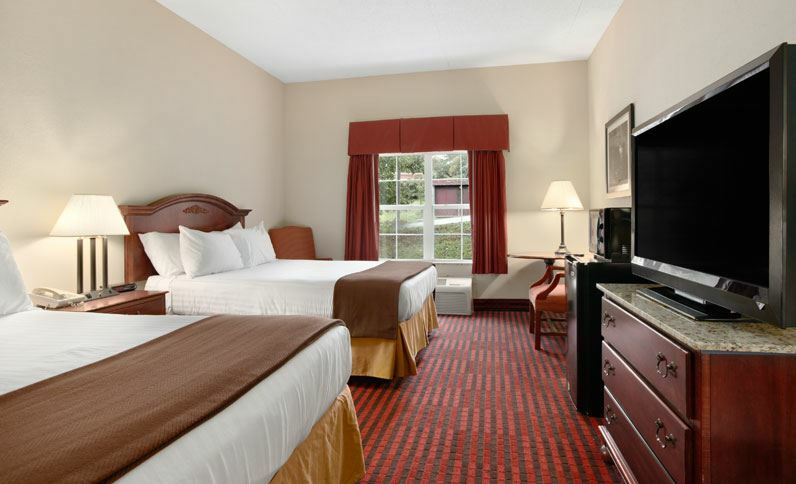 Well if you want a clean and convenient location with plenty of amenities, chose the Ramada Inn Pigeon Forge North. The Inn is located on the parkway in Pigeon Forge, and a Trolley Stop is located in front of the hotel. Popular live theaters are located a stone's throw away including Country Tonite, the Hatfield & McCoy Dinner Feud, Darren Romeo's Magic Beyond Belief, Memories Theatre with four legendary shows, and the Smoky Mountain Opry. But convenience to live shows, attractions and restaurants is not the only reason to stay at the Ramada Inn Pigeon Forge North as you will enjoy staying in an Inn that feels like home. Spacious, well-appointed rooms, indoor pool, complimentary continental breakfast, fitness center, sauna, a friendly staff and rocking chairs on the porch encourage you to sit a spell and enjoy the sites and sounds of the Great Smoky Mountains. Other amenities that you will enjoy at the Ramada Inn Pigeon Forge North are plush beds, flat screen TV's, refrigerators, microwaves and King rooms with a stone fireplace. You won't want to leave you room but the fun and attractions of Pigeon Forge are calling to you and they are all close enough to be convenient, but far enough away so you can enjoy the serenity of the mountains. http://bestreadguidesmokymountains.com/ or download the BRG APP for area deals, points of interest, interactive maps and more! Enjoy your stay at the Ramada Inn Pigeon Forge North and your visit to the Great Smoky Mountains! !